I’m going out on a limb and I’m going to tell you the truth, because I think you can handle it, because that’s how I want to establish our relationship and because, as my father said… ‘always tell the truth, it’s only one story to remember’. INVITED IN! is packed with incredibly useful learning that you can apply immediately to improve your business, and for some of you, to save your business. INVITED IN! is also designed to introduce you to the powerful concept known as The Law of Reciprocity. Truth. There is another product available through MOJO, our signature product, The Real Estate MatchMaker Why Everything Sells Best Fresh™. It’s a strategy and a system that when used well can change the life of your future client, your seller, and from there can not just change your life, it can transform it. To really influence another person’s actions, the behavioural-scientists have clearly shown us that we need to stimulate multiple emotions in any person we’re looking to influence. How to use The Law of Reciprocity is just one of six ways to influence your prospect’s actions that I teach you in INVITED IN! Another reason I wrote INVITED IN! is to ensure you’re aware of an incredibly frightening trend that is happening in real estate. A trend that is certain to continue and to grow. A trend that threatens to decimate the population of real estate agents, and yes I clearly teach what it is and show you how to become immune to that career-threatening, industry smashing virus. But really, a combination of those reasons above is why I want you to read INVITED IN! Having taken the time and effort to improve yourself by studying I believe you should be rewarded, and you will be. The most important reason I want you to be holding the book is to physically help you take a step towards your understanding of how powerful The Law of Reciprocity really is. By providing you with INVITED IN! I’m doing for you, exactly what I’m suggesting you should do with your own clients, your future sellers. I’m putting my money where my mouth is and I’m freely providing you with a gift of outstanding value. As you hold INVITED IN!, as you find value with the content and the knowledge you receive, as you feel a sense of gratitude and relationship building with me, I believe you’ll also hear a loud penny drop. “Hey!, This works! How can I do this with my prospects? !” is the loud sound the penny makes. The truth is, the purpose of INVITED IN! is to introduce you to the incredible power of The Real Estate Matchmaker Why Everything Sells Best Fresh™, and why you should consider using it to transform your business, your life and our industry. The alternative is remaining at risk of being cut down by the Virus. When you do use The Real Estate Matchmaker, you will also become part of a group of fearless real estate leaders, leaders who are prepared to do exactly what it takes to put themselves at the top of the real estate industry where they belong and in doing so make a major contribution to changing the way the world looks at real estate agent-consultants and our industry. You’ll be helping to re-create the real estate agent-consultant into a professional, into what truly is a Profession, not just a job. …or the real estate sales industry runs the very real risk of going the way of Kodak or Encyclopedia Britannica. Runs the very real risk of being smashed by a real estate Uber or a real estate AirBnB. Please fill out the form below now to receive your 100% free copy of INVITED IN! I WANT YOU TO MAKE A PROFIT ON IT! To guarantee that, I’m not only providing you with the powerful information in the book, for a limited time I’m even paying for the postage. (Take advantage of that offer while it’s still there!) Yes, it’s a real book that will arrive in the post, not an eBook. And yes, it’s 100% complimentary. 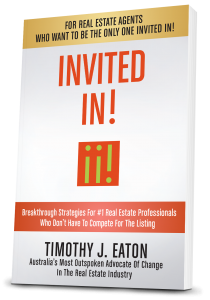 Your next step is to jump into the information contained within the pages of INVITED IN! 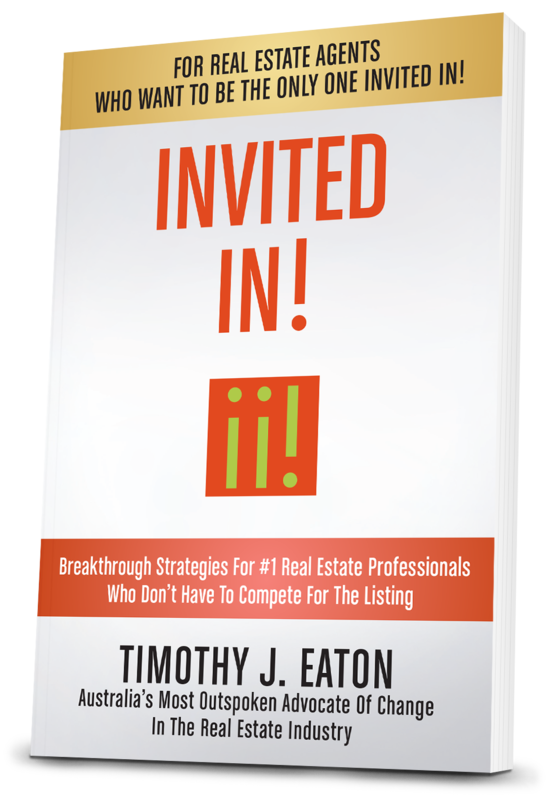 and from there, with your eyes newly opened, read The Real Estate Matchmaker and make your application to join the elite group of agents and agencies who have decided to take control of their own destinies and to make a powerfully positive difference to the perception of the real estate professional. When you become a MOJO Member and choose The Real Estate MatchMaker system as your calling card you take control of your business, you take control of your time and you take control of your financial future. You also take control of the future of the real estate sales industry, and for that I congratulate you and thank you.